The tactical nature of digital marketing allows a personal relationship to be built between a brand and a customer. The goal is no longer just a purchase. Every brand can now use social media to promote brand loyalty and best of all, fan amplification of brand messaging. From the Merriam-Webster dictionary, intelligence is defined as: The ability to learn or understand things or to deal with new or difficult situations. With this definition, we can say that simply looking at or reporting on data derived from social media is not true intelligence. It only becomes intelligence when there is something learned from the data or something is understood about a particular strategy being employed. 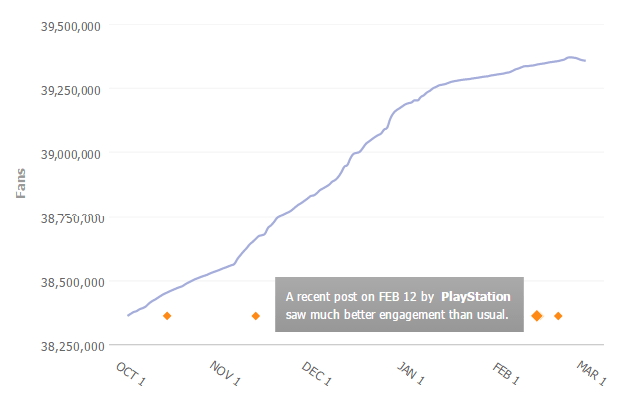 You might look at a chart of fan growth, one of the most basic metrics that social media analysts might look at, and see that there was a spike in growth. This is a very descriptive way of looking at something. To add intelligence to this data, one would need to understand why the fan growth suddenly spiked upwards. There is a vast amount of data being generated by social networks every single day. Many companies quite rightly monitor the data for information that impacts them, for example the number of mentions or the sentiment towards their brand. Social media monitoring is absolutely essential for brands, big and small, to know what’s being said about them. By itself, social media monitoring is not intelligence. If a brand receives more than 3,000 mentions with a positive sentiment throughout the week, it’s a great data point to report on, but it doesn’t delve deeper into the why. Furthermore, without a deeper analysis of the data, pulling in data points from multiple sources, there’s no learning that’s taking place. Social media reporting is simply presenting what has happened, but social media intelligence is asking why. To go back to our earlier example, a chart that shows the spike in fan growth is often a symptom of something else at play. When reporting on social media data, always be thinking of the ‘so what?’ when it comes to what you see. Diving deeper, you might find that the increase in fan growth corresponds to a particularly engaging post that was published. Now we’re gathering some intelligence. The next step is asking why that particular post was engaging. Was it an image or a video that was widely shared? Was the content about the brand specifically? Was it promotional in nature or a holiday greeting? A lot of content on social media today is promoted as brands look to reach a wider audience. Knowing if a post is promoted is necessary to better evaluate the results it generated. Reporting on social media data is a fairly easy task. If you want to start adding value to your report by adding a layer of intelligence, you need to start thinking about the why. For example, the average response time for a brand is an important metric to track, but diving deeper into the numbers and overlaying additional data might reveal opportunities. This brand gets most @-mentions at 11am. Engaging with the customers in a timely manner involves reducing your average response time. This piece of information is vital if the brand wants to improve their customer service efforts. What Can Social Media Intelligence Do For My Brand? Incorporating social media intelligence into every aspect of your business can have far reaching consequences. The important thing for brands is to disseminate the information captured from social media monitoring and social media analytics tools to all departments. How is Social Media Intelligence Gathered? The first step towards gaining social media intelligence is data. This data is collected from social networking sites via a feed known as an Application Protocol Interface (called an API for short). By itself, this data doesn’t represent social media intelligence – although it has the potential to do so. Metrics derived from parsing the data and overlaying other data points can be used for intelligence. For example, combining all the brands from the same industry together to establish benchmarks can be used for intelligence. Unmetric adds data analysts to the mix who manually tag all the content on Facebook and Twitter to identify campaigns and content categories. These data points are overlaid with engagement metrics to understand what campaigns perform well and the type of content that engages best with audiences. Social media produces so much data that it would be very difficult to analyze it without algorithms to sort and group data and present it in a way that humans can spot trends and outliers. Each social network has their own metrics that reflects social media success, and each social network may have a different role to play in your marketing strategy. Facebook is the perfect place for a brand to build and maintain brand loyalty and increase the reach of your brand and messaging. It is still the most popular social network, with 2.2 billion monthly active users and is often the starter kit for a brand’s social media presence – for good reason. With an audience this large, brands need to capitalize on insights available through Facebook. Data answers the basic questions of likes, shares and even impressions. You can keep an eye on these aforementioned metrics to ensure that your fans are engaging with your content. The higher the engagement, the higher chance of brand recall and brand loyalty. Engagement metrics, at the post level, the campaign level as well as the industry level is important to find what kind of content and campaign resonate best with your audience. Facebook’s analytics platform offers a multitude of insights into customer behavior. Businesses can learn not just about their audience demographic, but can also track the customer’s journey across multiple platforms. With all of this information, Facebook Insights is a powerful tool that can be used to increase ROI for a brand. Customer service has found its natural second home on Twitter. While also used for the amplification of content,Twitter has become the easiest, and often the most effective method of immediate customer feedback. This has evolved to the point that major brands now devote a separate Twitter handle just for customer service, manned not by the marketing team but the CRM team of the company. Your ART metrics can influence decisions on budget and staffing, to best serve the requirements of your customers because at the end of the day the easier you make it for customers to reach you, the happier they’ll be with your service. American aviation companies have been lately in the news for all the bad reasons. In response to their on-ground PR disasters, major airlines are revamping their social media strategies to effectively engage with their customers. Responsiveness is the name of customer service when it comes to social media. Let’s look at how the airlines are faring with regards to their response times. Analyzing Twitter data is like having a finger on the pulse of your audience, as well as the larger conversation surrounding your brand. Looking at the number of Retweets is great, but understanding the reason behind a spike in mentions is the kind of actionable insight you need. In the event of a brand related crisis, social media listening can keep you forewarned about any brand related conversations while social media analytics will keep you abreast of how your brand’s social media performance stacks up against your competitors. Metrics like Share of Voice can identify your brand’s ownership of key industry conversations – For instance, in the airline industry, understanding who has the highest share of voice for terms like ‘miles’, ‘rewards’ or ‘points’ can indicate necessary strategy changes to ensure that your brand is at the top of your customer’s or potential customer’s mind when the time comes for a purchase decision. As digital marketing makes its way away from text based content to more visual – photos and videos, photo-sharing social networks like Instagram are taking the lead. With over 800 million monthly users, Instagram is emerging as the primary platform for brands. With Instagram letting its users follow hashtags, it’s obvious that hashtags are going to stay relevant for some time to come. Data from hashtag analysis can help identify current trends in consumer patterns and even A/B test marketing strategies. For instance, by using a trending hashtag in your content, you can potentially get your message across to a massive audience. Identifying content as and when it gains traction could be pivotal in creating competitive content. Given the real-time nature of social media, metrics like posting time is also very pertinent to engagement on Instagram. If your brand posts gets good engagement on Facebook and you think you have figured out your social strategy, then you might be misled. Posting time can be relevant to a brand as audience engagement differs on different days. This particular brand can widen their reach by posting more content on Friday as audience engagement peaks on that day. Over 300 hours of video are uploaded to YouTube every minute. With over a billion users and a myriad of advertising options, it is the ideal visual medium. YouTube provides its own dashboard to show you the performance of your own videos, however, when it comes to performance of competitors’ videos, brands tend to fly blind. Unmetric’s YouTube intelligence has the ability to detect virality even before a video goes viral. Our data scientists take into account the growth rate of the video and compare it with the norm to see if something beyond the ordinary is happening. Another key metric to keep in mind is video duration. Though it differs based on content, this metric can give interesting insights into what works in a particular industry. For example, we’ve found that in the soft drink industry, Red Bull which made the longest videos had the most views and had the highest growth rate. Though garnering many views on a video is an important campaign goal, it is just as important to grow a brand’s subscribe base. Growth rates can be very promising while actual new subscribers added might be lower. Remember to compare the two numbers while also benchmarking to find the average in your industry. Robust YouTube intelligence can help improve your channel performance while also keeping an eye on how competitors are doing. From the perspective of your business objectives, social media intelligence can be interpreted in so many ways. Promote offers, announce product launches or brand news, receive feedback, or even ask fans to help you choose a brand ambassador. Getting customer insights have never been easier, and if you’re not analyzing your social media analytics to learn more about your customers, you’re wasting a precious (and easily accessible) resource. So, how do you choose a good analytics tool? Social media is a crowded space when it comes to tools to analyze social media data. There are tools for social media listening (which might also call themselves social media monitoring), there are tools for social media analytics (which might also be social media monitoring tools) and tools for social media benchmarking. One thing they have in common is that they all claim to offer social media intelligence, so how do you make a decision on what to use? The first step is to know what exactly are you looking for social media intelligence on? A social media listening tool can help with the first two items in the list. Listening tools monitor social network sites as well as blogs, forums and media sites and are looking out for particular keywords which you enter into the app. It parses the data to help give you an overview of how much buzz your brand is generating, groups keywords together to help you understand what the gist of the conversation is and lets you know how the marketing views your product or brand. A social media analytics platform like Unmetric is used to gather intelligence on how you can create better social media marketing strategies by analyzing your own efforts and that of your competitors. Unmetric’s Analyze platform allows your brand access benchmarks for multiple metrics, all in one place. Data driven decision making is key to businesses’ these days. The right social media analytics tool can transform the volume of online chatter into social media intelligence, which in turn can drive strategic business decisions and boost performance.